eBooks are a time-honored marketing technique. You can take good blog posts and expand them into good books, give them away to boost your mailing list, and sell others on Amazon and the like. It’s a great way to expand your influence and build some passive income. One of the hardest parts of an eBook is not actually the content. After all, you’re used to creating content for your site. Instead, it’s the design. A cover and a compelling internal design will make your eBooks and other publications stand out that much more. Now, when you’re making an eBook, you have three options for design. You can do it yourself, which is time consuming and might produce sub-par content if you’re not an experienced designer. You can hire an experienced designer, but that costs money, potentially more than what your expected returns on the book will be. Or, of course, you can use a free template. The downside to using templates is that, well, they’re templates. People who do a lot of eBook reading might start to recognize templates, and will recognize when you’re using on. Will that impact their opinion of your book, your content, or your brand? Maybe. It depends entirely on what their opinions are on template use. Some people won’t care or notice. Some people won’t let it change their outlook. And, yes, some few will look down on you for not using a custom design, but those people tend to find flaws everywhere. Templates are big online. Plenty of other blogs have created their own template lists. So, rather than create a template list for you, I’m going to create a list of lists. 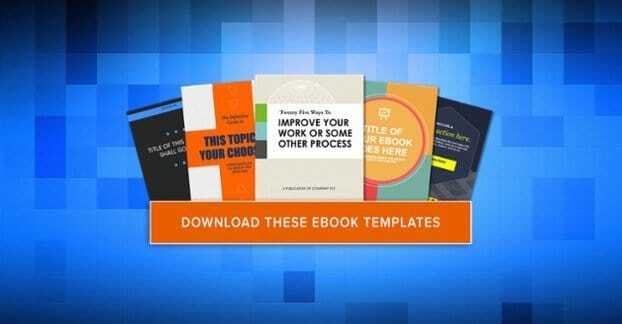 Consider this the ultimate masterlist of eBook templates. Additionally, if you have a list of eBook templates (that isn’t just pulled from these other lists) let me know and I’ll add it. Five Free eBook Templates from HubSpot – This is a selection of five high quality eBook templates from HubSpot, one of the biggest blogs in marketing. They include templates for covers, title pages, content layouts, tables of contents, and everything else you’d need for your books. It’s a cunning combination of graphic design and publication layout, with customizable text to add and adapt for your books. This selection of eBook templates is one of HubSpot’s primary mailing list building offers, which means they want a handful of personal information in exchange for the download. Name, email, phone, website, company name, and some company demographics all help them file your information away as part of their audience. You don’t have to sign up for their blog, you can unsubscribe from their mailing list, and you can even use burner information if you really want. I would say the templates are worth it, though. 13 More Free eBook Templates from HubSpot – This list is another, very similar to the previous one, though there is no overlap between the two. This selection is over twice the size, with a variety of different graphical styles for the various eBooks they have on offer. Again, this is a high profile offer for HubSpot, so they want to collect a bunch of personal information. In fact, their offer page is virtually the same design, and they ask for the same selection of information. And, again, the selection of templates is well worth the price of admission in terms of personal information. Two Free eBook Templates from Small Biz Trends – There are only two templates here, which means there’s not a lot of variety. One of them is made more for reports and a corporate style, while the other is more modern. They’re both relatively simple and are provided in .docx format directly within the article. I understand if they don’t look all that great after the brilliance that is HubSpot’s design, but that’s just the world we live in. Thankfully, you don’t have to add any information in exchange for these; they’re 100% free of even an opt-in, you just download them via the link provided in the article. 10 Inspirational Designs from Fizzle.co – This one is a tiny bit misleading. Their table of contents and their subheading both indicate that they have a section for templates in their post, but the “templates” they provide are actually just image files. They don’t have source files to download and adapt, which means they aren’t actually templates, they’re just inspirational photos. You can use these to inspire your own design, but you’ll need to put it together from scratch. A Selection of Photobook Templates from Blurb – These templates are themselves free to use, but there’s a catch. They come in two styles. First are the Bookwright templates. Bookwright is an eBook creation software provided by Blurb, currently in beta. As long as it’s in beta, they claim, it’s free to download and use. However, in the future this might no longer be the case. The other half of the templates are Bookify templates, which are designed for use in their Bookify app, which is a similar eBook creation engine in a web-based app. Again, free to use, though you may be encouraged to buy stock photos for use in your book, and other CTAs related to their marketing. Four Free eBook Templates from LucidPress – LucidPress has a variety of different templates on their site, all of them available for free. They only have four templates for eBooks, with different purposes behind each one. You can see a complete “look inside” preview for each one prior to downloading. As for the cost of downloading them, you have to use the LucidPress design app through the web in order to use their templates. It’s a free app with some restrictions and some upsells, but it does mean that you can’t just export the template and use it however you want. Two PowerPoint eBook Templates from Hectorpreneur – These two templates are both six-page PowerPoint designs you can adapt and use for your own books. They have a cover page, a table of contents page, a chapter title page, a sample content page, a sample content page with an image, and a sample content page with a stand-out quote. You can mix, match, adapt, change, and run with the designs as much as you like. They are provided in PowerPoint format on the assumption that most people have the basic Microsoft Office suite on their computers. A Handful of InDesign Templates from BestInDesignTemplates – The templates here are made for InDesign, a professional designer tool used by a lot of book publishers and magazine producers. Finding good templates that work in the program can be a hassle, which is why this link is great for those of you who can use it. 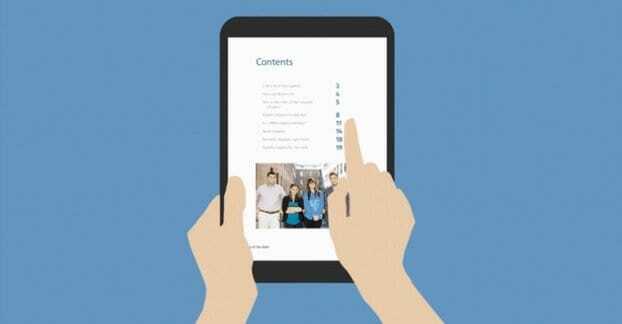 The templates range from catalogues to brochures to standard books, covering a variety of different topics. There’s something for everyone here. They have a ton of premium templates as well, and an account with their site is just $6 per month, so it might be worth it if you find one you really like. One Free Template from And Possibly Dinosaurs – This is a great, quirky blog you should all probably be reading. This particular post is about seven things every blogger should know about InDesign, and it’s a good argument for why more companies should adopt it over the tools they currently use. However, I’m primarily linking it here because it includes an eBook template along with the excellent information. Canva – I recommend Canva a lot, because it’s an excellent tool. However, it’s hard to fully recommend here as a free “template”, because it’s neither. It’s not free, and it’s not a template. The way Canva works is it’s a template engine. It has a few dozen designs, from social media posts to eBooks to album covers to posters and menus and more. You choose a design and then you can personalize it. 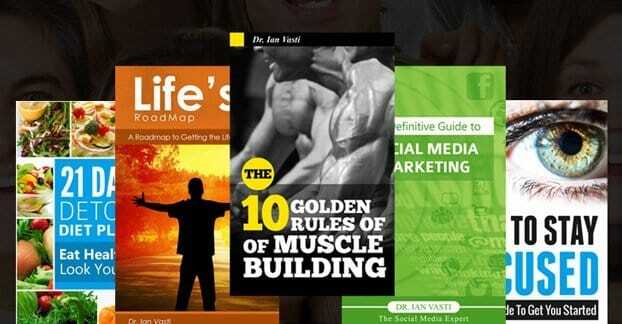 For eBooks, for example, they have a few dozen book design styles, and more all the time. Some of them are free, some of them are not. Keep this in mind. Next you can add and adjust elements on your document. You can add pages, add images, put in grids, draw shapes or free draw, add text, and a whole lot more. Many elements are free, as are some photos, while a lot of other photos and elements have their own charges associated with them. It’s perfectly possible to put something together for free on Canva, and if you do, that’s it; you’re done, for free. If you choose to use paid elements, they can range from a few cents to a few dollars each. When you “buy” an element, you’re renting a license to it for a month. You can use that element in an unlimited number of products, until that license expires, at which point you will have to pay for it again. So, your eBook can be free or it can be expensive, depending on how many premium elements you use. In either case, Canva is an amazing tool and should be bookmarked by every serious marketer. It’s not a replacement for a graphic designer for your top-tier productions, but it’s an amazing tool for just about everything else. Yes, I know that the focus of this article is on free templates, but there are plenty of good templates out there available for a very minimal fee. If you can pay a little bit to get an excellent, functional template that stands out and boosts your conversion rates through the roof, wouldn’t you want to make that investment? It’s up to you, of course, which is why I’ve provided the option. 27 Templates from Joel Friedlander of TheBookDesigner – These templates run the gamut of design styles, and all have a specific type of book as the focus. Prices range from $27 and up, and work for both print on demand and eBook designs. A Wealth of Premium Templates from GraphicRiver – Graphic River is the templates and graphics side of the Envato Marketplace, which you’ve seen all around with ThemeForest and CodeCanyon and all the other digital landscape sites. There are over 100 templates here, ranging from about $12 to the mid-$20 range for prices. The eBook Evolution System – This is a premium-level system for creating and publishing eBooks, along with a selection of templates, designed for big brands. The system itself is $300 in a one-time payment. You can get the 22 templates without the system, in PDF format, but that alone costs $200. Creative Market – This site is sort of like an Etsy of digital resources. 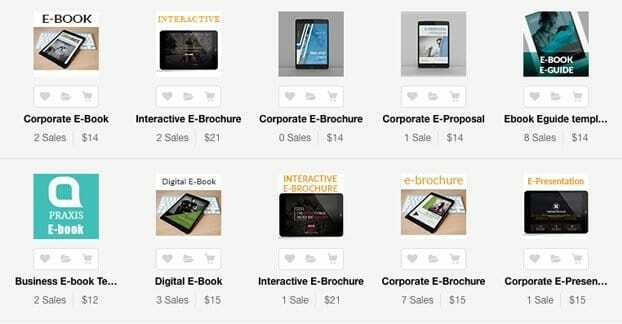 All of the templates for eBooks here – and they have 215 of them – is something hand-made to sell on this marketplace. They range in price from $4 to $40 and cover a whole bunch of bases. Some of them are little more than samples in PowerPoint, while others are much more robust and made in InDesign or Photoshop. 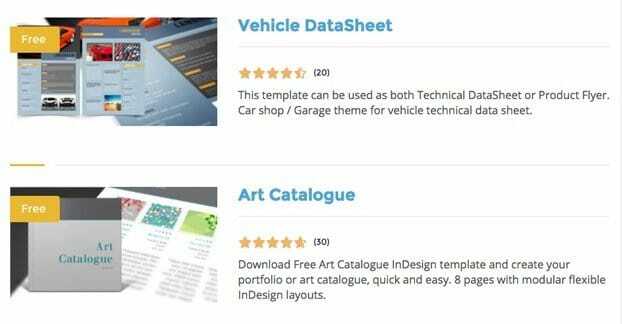 I’m sure there are other marketplaces out there, but as the primary focus of this article is on free templates, I’ve chosen to leave some of them off of the list. Again, if you have free templates on offer, feel free to leave a comment and I’ll check them out. Let us know what you think in the comments below!